In our last post, we exposed that Shunichi Fujiki a.k.a. 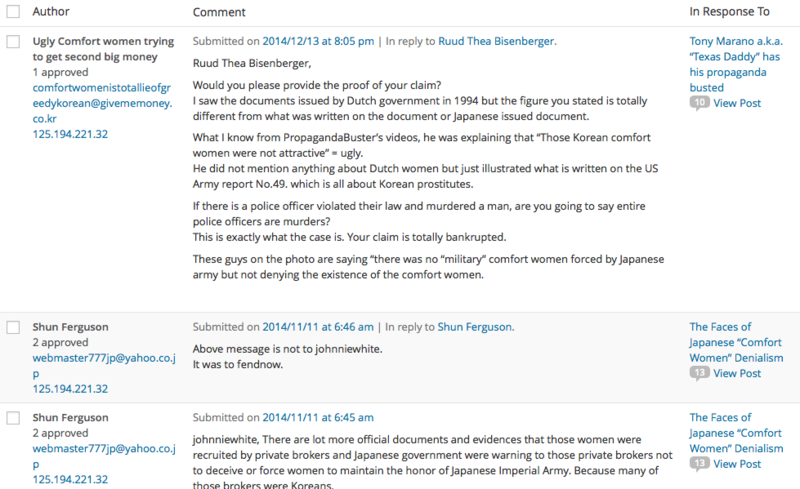 “Shun Ferguson” (Japanese representative of “comfort women” denier “Texas Daddy” a.k.a. Tony Marano) had used the pseudonym “Comfort women trying to get second big money” and the fake email address “comfortwomenistotallieofgreedykorean@givememoney.co.kr” to post a comment on our blog, which is completely unacceptable. He was caught because the post originated from the same exact IP address as the one he had posted from previously. Mr. Fujiki has not responded to the allegation, but “Texas Daddy” himself responded, demanding that we “prove” that Mr. Fujiki was indeed responsible for the offending comment. Fine then, here is the proof. “But you could have doctored the image!” you say, Mr. Marano? Okay, here’s the screen recording showing how I log into WordPress and list comments originating from 125.194.221.32. Of course, even that could be fabricated, theoretically, so Mr. Marano could continue to believe that his good friend would not do such a despicable thing if he so chooses. But most readers would understand that we have no reason to go out of our way to fabricate an evidence “proving” how despicable Mr. Fujiki is; we believe that his “comfort women” denialism is already damaging enough. If that’s not good enough, though, we have a proposition for you, Mr. Marano. We are willing to enter into a binding legal contract whereby you front the money to hire a reputable forensic computer expert to verify our claim. If it turns out that we had fabricated any of the above evidences, we will pay you double the money you fronted. It’s up to you.